Thread: Alberta Aviation Museum - The Future? Have you considered a small display at EIA similar to the aviation museum at the airport in Las Vegas? Perhaps a place could be found to hang a plane for display. Add a few display cases and information on the main location? We already have a small display at EIA on the departures side but additional displays have been hard to co ordinate due to agreements EIA has with various contractors handling adverting or anything that can be construed as advertising. We do appreciate the support we get from EIA though. The museum is a gem that cannot be permitted to leave. The amount of effort and money is almost incalculable.This will be a great look see if the city actually cares about a genuine Edmonton Heritage venue. Something to throw at the Mayoral candidates this fall.!!!! Thanks and if things are not resolved or answers still waiting maybe it will be something for the candidates, we have many members getting as frustrated as I. How many visitors will drive all the way to the International to see the Aviation Museum? Why? Is it only accessible by plane or something? It won't be moved. Obviously you have little idea of the business model of museums, otherwise it wouldn't sound dumb. Most tourists (and residents) won't drive 30-45 minutes to see a museum located in the YEG. However, one located a few minutes from downtown (by car, bus or LRT) is more accessible and will draw far more visitors than one located out in the sticks. That's why the new art museum was built downtown, not in Leduc. Tourists and residents won't drive 30-45 minutes to see a museum. If that was the case then the Royal Tyrell Museum in Drumheller and Head Smashed in Buffalo Jump shouldn't exist. Yet I know many local families and tourists that have taken the 2+ hour drive to see those museums. ^and don't forget the Reynolds museum ( bi plane ride is a blast) too. Oh wait all these places receive govt cash so we can't use them as comparisons. "The topic of moving to YEG has come back up so I thought it best to address it again. I wish the folks at EIA the best in their plans but putting the museum there is simply not a top choice. Locations that far from a Metro centre simply do not do well and in our case it is magnified. a) We are home to more than just the Museum and moving would make all the other organizations homeless..about 1000-1500 members and volunteers. b) As a private not for profit society (as opposed to a Government Museum) we have to be operationally self sufficent. Which means we rely on our volunteers and their efforts to keep costs in check. Discussions with our volunteers it has been made clear that if they have to make a major commute to volunteer most will not. c) We provide a venue for a series of not for profit that work with people with physical and mental challenges as a place for work experience and social interaction. A commute to YEG would end these programs. d) To a very large extent we act as a seniors drop in centre for many of the members and others. A commute to YEG would end these programs. f) Interviews with Educators using our programs have made it clear that the cost of transportation to the current site is the single biggest issue in coming to the Museum. Its expensive and a pain...a larger distance will result in fewer schools using the programs. Strangely enough out of town, out of region and out of province schools do not have as much concern about the cost and hassle of transport...go figure. g) A large portion of our operating income is derived from the rental of a section of our facility for functions as wide ranging as cultural to sales events. Again the distance involved would drastically reduce the income from these operations and make us economically unsustainable. h) The biggie...visitors, interviews with Museums in the USA that are on or adjacent to International airports have made one thing very clear. Travelers going to the airport do not impact admissions. Think of how you are when traveling, you get to the airport when you have to to catch your flight, when you get off you immediately head to you destination. The vast majority of people do. So from the interviews there is no gain in admissions with an International airport location. With the distance involved visitation form the Metro centre drops...making the facility unsustainable economically. From the Airports side there are two big points. We would detract from their retail operations and provide no income, in effect costing them money on space they generate no revenue from. Our flight ops, because of speed and other operational differences, would be counter productive to revenue traffic, again costing the airport money. If International Airports were great visitation drivers for attractions there would be tourism destinations clamoring to get a location at the International Airports. EIA does a great job of many things, but a museum location is not one of them. Most of these point apply to ANY location a similar distance from the metro area, not just EIA/YEG and researching museums around the world has lead to these conclusions. Hope this explains the issues, clears that this is not an anti EIA issue and answers some of the questions. Late edit: Royal Tyrell, Head Smashed in Buffalo Jump and Reynolds Alberta Museum are 100% Provincial Government funded for operations and capital fixed assets. Last edited by Thomas Hinderks; 26-05-2010 at 08:57 AM. Perhaps with the expansion a more substantial display could be worked out, something in the public area. It doesn't make sense to me that advertising contracts would prevent a non-profit display but what do I know? A bit of signage on the displays with the name of the museum displayed and a rack with some brochures. And we will continue to work with the folks at EIA on this avenue. As a way to promote the museum, wherever it may be, has there been any interest or thought about working with the city and purhaps having 1 plane (if you have any extra's) to be mounted on a podium at Gateway Park near Leduc #1 Oil Derrick? Sorry I couldn't reply sooner...real world stuff and all that. 1) It would have to be a replica not the real thing, maintenance on aircraft mounted outside is huge and if not kept up...they come down on their own it you get what I mean. We have learned this from the ones mounted at the Museum. 2) Vandalism...with the real thing a huge problem costing us $$$$ a year to keep up. In this case it is not graffiti its outright damage. Again something we have learned the hard way with the aircraft mounted at the museum and you can see how high they are off the ground. So the idea is a sound one, there are just some "challenges" to overcome to make it work. I think that the City should make preservation of the historic hangers at Blatchford a key requirement of the site redevelopment contest. Whether they are maintained to house aircraft as part of a mini-plan to keep a renovated and modernized museum on-site or keep them there for other institutional sites needs to be decided with Mr. Hinderks and Co. In my mind having it relocated to the YEG makes the most sense, simply because you've got runways you can use for historic flights, plus with the completed Anthony Henday, and ETS access getting out there isn't the chore it used to be. I'm sure they will look at other airports in the region, but I think with the QE2 right there, the Alberta Aviation Museum could become a major destination at YEG. Preserving the historical buildings is very important, our is protected but (2) others are not...the last wood USAAF hangar and the first steel structure USAAF hangar...and it would be a shame to loose them. If you take a look at post #75 on this thread you will have a bette understanding of why YEG is not a preferred site. As for me being part of the decision making process...I think it will be the "and co."
Read that, and really I do hope there's a way the City can help you guys maintain everything you do that requires a runway at another airport in the Edmonton area, or find ways to invest in new facilities at Blatchford to maintain the activities that don't. Again, what the mix is, or whether to keep it all together is not my expertise. Villeneuve, and Cooking Lake seem like they would probably detract from your current attendance, whereas because YEG is located close to the QE2, Henday future ETS service etc. I can see it helping at least a little bit. Most of us probably rush to get to our flights, and certainly business people wouldn't have time for it, but for families seeing loved ones off, or for those small numbers of passengers that have a few hours to kill, I suspect you would see your numbers go up. Again, and I really want to stress this, I think the City should be looking at ways to invest in and expand the Aviation Museum as a partner (wherever it's located). I'm imagining flight simulators and other fun interactive exhibits for the kids, and the young at heart. At the Pacific Aviation Museum on Ford Island in Pearl Harbour, my family and I took in the exhibits there (rather excellent), but I was seriously disappointed with their flight sim area. It was buggy and not much fun. Great concept. Poor execution.
" At the Pacific Aviation Museum on Ford Island in Pearl Harbour, my family and I took in the exhibits there (rather excellent), but I was seriously disappointed with their flight sim area. It was buggy and not much fun. Great concept. Poor execution. I think we could do better here..."
Quite familiar with this museum and used to know the ED (now at the museum of the marines). Our flight Sim tech is so far past their level its scary...I just had a corporate function with 150 people flying on 2 of our sims in WW2 trainers over 1942 Edmonton! We are far more diverse, our collection is many times larger and our education programming world class. What they have that we don't is the polish of money.
" I'm imagining flight simulators and other fun interactive exhibits for the kids, and the young at heart." So you are aware...flight sims I mentioned, we have interactives both computer and mechanical for children of all ages..plus our computer education area and 11 mini theaters. Saturday afternoon the sims are open to the public and you can do a cockpit tour of the 737 with a 737 pilot or crew member. "Most of us probably rush to get to our flights, and certainly business people wouldn't have time for it, but for families seeing loved ones off, or for those small numbers of passengers that have a few hours to kill, I suspect you would see your numbers go up." Unfortunately research show the number would go down as describe above. I think it's you who doesn't know what he's talking about. You missed the point. Whats the difference between driving 30 minutes to the city center airport in Edmonton versus the 30 minutes it takes to drive to the International airport? Visitors from the region will find the International easy to get to using the highways and freeways of the region. The Tyrrell Museum IS world-renowned. Hard to believe, we're so used to third-grade envious looking over the shoulder, but in this case there it is. The museum isn't moving, even with CCA closure, so this discussion is pointless. The idea that a museum has to be right in the centre of town for anyone to visit it isn't backed up by any facts whatsoever. Oh really...from student association to Museum expert. We should meet after Airfest to discuss this one face to face. You are absolutely right...and the conversation is pointless. ^ much like the conversation about opening YXD to air passenger service again. But people are still investing big bucks into that conversation, even after council made a firm decision (TWICE now) to close the airport to passenger scheduled air service. More than willing, if you want, Tom (although I certainly didn't claim to be an expert). But as has been stated by others, there are plenty of examples of museums outside of Edmonton that get visitors. I'm not saying that your museum has to move. I'm just saying that museums don't necessarily need to be in the middle of town. But as you have said, your museum isn't going anywhere anyway. But the runway attached to it is. - How many museums have you researched? How many countries? - Have you dicussed International Airport locations with people like the Smithsonians Udvar Hazy Centre, Kansas City, Hamilton, the Air Zoo? - How many Executive Directors/Presidents/Curators of museums have you interviewed? -How many teachers and schools have you discussed museum locations with? -How many volunteers have you discussed location with? -How many stand alone tourism attractions have you done the same with? -Have you compared the locations of Government subsidized Museums and attractions vs private and not for profits that do not get government operational dollars. -Have you looked into the demographics of the successful museums regions and catch basins? Cause frankly if you haven't the debate is as pointless as me discussing the operations of a Student Association. Again, Tom, I never claimed to be an expert. Just said that there are museums outside of city centres that get visitors. Not big stretch, my friend. Certainly not worth your vitriol. I understand that you're really ****** off, Tom. But attacking me for not knowing the inner-workings of a museum because I have stated that people visit museums that aren't in town is beneath you. Saying that doesn't require knowing how to run a museum. Just like when the CCA debate was going on, it didn't stop others from commenting on where it was best for NAIT to expand. "Again, Tom, I never claimed to be an expert. Just said that there are museums outside of city centres that get visitors. Not big stretch, my friend." Thats not what you said...because frankly it would not have raised my temper. "The idea that a museum has to be right in the centre of town for anyone to visit it isn't backed up by any facts whatsoever." Bolded by me for effect. So you made a very distinct statement saying there were no facts to the location issue and now you are back tracking because you don't know the facts because you haven't done the work. Thats what pisses me off...I have taken the time several times to point out the issues and problems with location on a series of threads, done a ton of work on the issue and presented a report to council on it. So when you start citing facts when you are expressing opinion I think I am allowed to get upset. And again, Tom. I didn't claim to be an expert. Of course, you are an expert and if you are saying that a museum of any type has to be smack dab in the centre of a big city in order to be prosperous, then I will retract my statement and defer to your knowledge. Of course, you are an expert and if you are saying that a museum of any type has to be smack dab in the centre of a big city in order to be prosperous, then I will retract my statement and defer to your knowledge. 1) I have never claimed to be an expert, but I do the best job I can with what i have to work with. 2) I have never said "a museum of any type has to be smack dab in the centre of a big city in order to be prosperous"
What I have repeatedly said is a Metro location is very important for a whole series of long term considerations relating to everything from volunteers to education programming use and attendance in general and as a private not for profit as opposed to a fully funded government museum we face a whole series of different issues. All based on hard work digging the information out, in many cases having to spend hours on the phone to get it. Thats without getting into the whole historical relevance issue. While Medwards often annoys me I do give credit to his opinion and he seems to do very well at separating expressing his "opinion" vs "stating facts". i think you bolded the wrong part of the sentence... perhaps it would have been better if JasonR had bolded it as follows in the first place: "The idea that a museum has to be right in the centre of town for anyone to visit it isn't backed up by any facts whatsoever" in order for the emphasis to be as i read it, not as you chose to read it. the statement wasn't that being right in the centre of town made no difference, the statement was that being right in the centre of town was not "the" prerequisite for anyone to visit. we both know one of the world's premiere air museums is located about 5 km south of downtown tillamook. on the other hand, we also both know that tillamook has a population that is still less than 5,000 and can arguably be said to be in the middle of nowhere. we both know that it is adjacent to an operating airport as well as being on the pacific coast highway 101 in oregon where it uses a quite pretty a-4 on a stick as a road sign (as if one could miss the nearby blimp hanger that houses the museum). we also both know their funding models and resources and a host of other issues that affect a museum's viability are not the same as yours but the key to success for any museum is the sum total of what can be offered, not solely its "proximity to the centre of town" which is really all that JasonR said. might "proximity to the centre of town" be "the tipping point" for the viability of any particular museum? perhaps. but that only raises all of the other/broader questions and issues that determine any institution's success - it still doesn't make it "the" issue you seem to have taken offense at and it doesn't make JasonR's statement the incorrect one you are making it out to be. If Jason had expressed his thoughts as an opinion I would not have even noticed it. But it was stated as fact. As far as Tillamook, it is an example of one that seems to get away with breaking alot of rules and does not share information or even attendance figures so analysis of it has not been possible. "we also both know their funding models and resources and a host of other issues that affect a museum's viability are not the same as yours but the key to success for any museum is the sum total of what can be offered, not solely its "proximity to the centre of town" which is really all that JasonR said." Here we agree (except for what we view as what JasonR said), but as a real estate professional and highly experienced in development I am sure you and I will agree on the importance of location to a successful business. "might "proximity to the centre of town" be "the tipping point" for the viability of any particular museum? perhaps. but that only raises all of the other/broader questions and issues that determine any institution's success"
"What I have repeatedly said is a Metro location is very important for a whole series of long term considerations relating to everything from volunteers to education programming use and attendance in general and as a private not for profit as opposed to a fully funded government museum we face a whole series of different issues. All based on hard work digging the information out, in many cases having to spend hours on the phone to get it. Thats without getting into the whole historical relevance issue." Which in turn has been determined by doing the research on a very wide front and that research has lead to the conclusions we are operating with and that we have discussed off line. "it still doesn't make it "the" issue you seem to have taken offense at and it doesn't make JasonR's statement the incorrect one you are making it out to be." And coming full circle...expressed as opinion it likely would not have even got me to post...but it was stated as fact which is what has lead to the last number of posts. So while I appreciate the point of view Ken and understand the overall point you are trying to make I think today we will disagree. Well then Tom, please accept my apologies. I will rephrase. It appears to me that the idea that a museum HAS TO BE in the centre of a big city isn't backed by any facts whatsoever. Furthermore, I would consider a location at EIA to be a "metro" location. ... I will rephrase. It appears to me that the idea that a museum HAS TO BE in the centre of a big city isn't backed by any facts whatsoever. Furthermore, I would consider a location at EIA to be a "metro" location. I agree that the museum could and should be an integral part of EIA and that is where its future will surely be...with land to expand, amenities in abundance, a steady stream of paying customers many with time on their hands to visit and ina much better and accessible location. Plus - an Airport Authority that will surely prove to be a great host and support. The City and all Metro should contribute capital costs for relocation. This one ranks right in their with the "you can't close one runway and change the circuit" argument put forward on the other thread. And if EIA is a "Metro" location I can hardly wait for NAIT to move there, oh yeah Elerslie was too far I forgot, my apologies. If you are so convinced I suggest you put together the business case and present it to EIA and the Museum board. Well Tom, what you say makes sense if a technical institute is a match for an international airport. Probably not. I wonder if an air museum might be, though? Not really related arguments at all, since based on the criteria that YOU gave for why a metro location benefits a museum, EIA easily fits the bill. But being facetious was more fun I guess. But then again, I'm happy for anyone to come down to NAIT and go to the Business Tower lounge and see just what that airport has done to our downtown's development and the rest of the core. It can all be seen from there, and it's so obvious that nobody can miss it. Deny it all you want, it's there for all to see and it would continue if council hadn't made the correct decision to close the City Centre Airport. So the air museum may well stay where it is, but it will do so without a runway attached to it. I agree 100%, and no Tom I do not have a business case and i do not plan to create one. My opinion is that it can work for the many reasons stated before, plus there are a couple fo runways that work. And before you give an argument that the museum planse and the jets do not mix, perhaps you should mention it to the small aircraft already out there. Well Tom, what you say makes sense if a technical institute is a match for an international airport. Probably not. Perhaps there is an opportunity for the aviaiton programs to be at YEG, they could be revitalized and help bring a greater aviation interest to our youth and have trained people for new aviation industries at YEG! Far away from clueless people. BIIIIIIIIG BUMP UP on this topic! (Check the last post date.) I just wanted to congratulate Mr. Hinderks and the folks at the Alberta Aviation Museum, along with the folks at Air Spray Ltd., whose donation helped the museum acquire a Canadian-built CF-104. I am personally very much looking forward to bringing my young boys to check out "the dart". Very nice acquisition, Tom. I hope to hear more news on this development. The Starfighter we are getting is a two seater, all two seaters were built by Lockheed even the Canadian ones (we built ALL of our own single seaters). The one we are getting did not serve with the RCAF but is identical to the RCAF ones and when finished will represent a specific RCAF Starfighter. The good news is we are getting it thanks to the Hamilton family, Air Spray and all the other many donors and with two seats twice as many children will get to experience the Starfighter (under supervision) when it rolls out. This aircraft will not only tell the History of the Starfighter in MIlitary service here in Alberta but also the story of the Edmontians that overhauled them at North West Industries, become part of our "hands on" education programming and inspire a new generation to reach for the sky, both figuratively and literally. Thanks Yegatc and everyone else that supported the project. Thanks for correcting the info. Must've read a piece of literature from one of our many "fine" aviation experts that litter our news agencies. Nevertheless, pretty slick addition. Congrats. My dad worked on the 104's at North West Industries. He's pretty excited about this. Let him know it will arrive April May and we will be looking for volunteers to reassemble and get the aircraft ready for its roll out in late summer. Most likely give him a chance to see peers and old friends. Which is as important as getting the aircraft in some ways. Well, he's 86 so I don't think he'll be doing too much reassembly. <grin> He could supervise though/ He was always good at telling me what to do. Seriously, he was an instrument tech so he may be able to help out in some way. I am sure he can...and he will have a good time doing it. At a minimum he will have to be here for the roll out! Visitors are always welcome to our restoration area when it is manned!!! So yep I'll let everyone know when it arrives. I just caught the news on City TV this morning. I've very happy to hear of the new acquisition for the museum. Will you be able to fire up the engine once in a while ? Well done Tom (and the rest of your hard-working team). A choice acquisition. Hopefully you'll actively display your Starfighter, unlike the Reynolds-Alberta Museum who have let theirs fall into tatters, last seen sitting all by itself near the fenceline in amongst a pile of junk, when I pulled into the registered participants entrance at History Road this past June. Another fabulous acquisition for a world class museum. Thanks everyone and to answer your questions. Provided it can be done affordably we are going to get the engine running over time and yes run it regularly like the 737...nothing sounds like a Starfighter with it's unique howl. The plan is to do night runs (if we can get the enigne systems safely working) it is absolutely spectacular to see a sonic shock wave as it comes out of the engine at night. We are planning on borh static and interactive displays, allowing the public to enter the aircraft cockpits on selected dates (and under supervision) the goal after all is to educate and inspire. After nearly a year of dealing with unbelievable bureaucracy both in Canada and the Netherlands the Starfighter is finally being shipped. We are hoping for an arrival late 2012 early 2013. 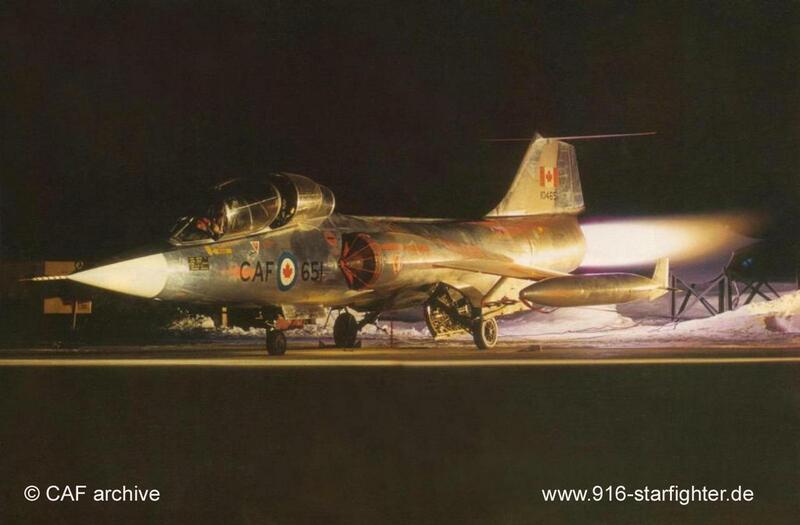 This aircraft was lost in a big ingestion incident while serving with 417 Squadron in Cold Lake. It was chosen as the aircraft was lost but the crew survived unharmed and it is representative of the story of the CF-104 in Alberta. We hope to make it ground runnable as it appears in the picture. Extraordinary to even locate one that can possibly be restored to runnable at all. Amazing indeed. So I was wondering, once it has been restored, where will the jet go. There wasn't too much room left inside, is there? The Starfighter will have to go outside in the east jet display area beside the CF-101 Voodoo that is on display. There is no room left inside and we have pushed the aircraft together to the point where we are not happy with the way we have to display them...space is at a crisis level for us right now. Would it be possible to dismantle one of the other hangers and reassemble it next to the museum? I know it would cost $$$ but it would be nice to save another one of them before the redevelopment kicks into high gear. Perhaps you could share space with one of the other museums (ETS, etc). I wish the folks out at EIA would provide the space for the museum as part of the new phase of development - a living museum tied right into the airport. It would be great for families flying through. I noticed the planes hanging from the International Terminal in SeaTac airport when I was there last...pretty cool. But it again comes down to space. We have been working with the COE over the last number of years to determine how we fit and what will be available, those discussions should be coming to a conclusion in the near future and then we will move ahead. Rather than go through this discussion again I would ask you refer to the prior posts that have clearly outlined why this is not an option for EIA or ourselves. I know your views Tom. But nothing is stopping EIA from buying planes and hanging them like other airports have. They could have some planes sitting on the floor as well and allow the public to touch and sit in them. Just saying. But nothing is stopping EIA from buying planes and hanging them like other airports have. They could have some planes sitting on the floor as well and allow the public to touch and sit in them. Just saying. And if they decide to do that the museum would be happy to assist them as they already know. Hanging isn't a big deal except for cost (high) and mounting (again high), sitting on the floor without staff to monitor and oversee is a serious liability issue and sitting in them unsupervised magnifies the problem. Maintenance when the public is allowed near aircraft as well. Which is why most museums do not allow people near aircraft on display, we are an huge exception, covering the additional costs of insurance, maintenance etc. With the CF-104 on its way, what maybe the museum's next acquisition? How much money will be needed to be raised for it? I note with interest some of the bureaucrates at City Hall are projecting the closure of the last runway at YXD in October. Would any of your future acquisitions require the runway? The next we are committed to is a Bristol Freighter, this will be a long term project as it is being recovered from a lake in the NWT (it's coming in chunks) so no runway required. It is an aircraft that was flown from YXD to the lake and broke through the ice on landing to deliver cargo. We are also the first non military museum on the list for a Hercules from DND but if they don't start releasing them before the runway closes we won't be able to get one. Same with a DC-4/DC-6 we are trying to get privately. I have also just sent the request for a CF-18. Then there are another roughly 40-50 aircraft on the acquisition list. Some like the AVRO Avian, Dehavilland Cirrus Moth and some others will have to be replicated in house from scratch. Others like the Ford Tri Motor Grant McConachie used (the actual one that McConachie owned is for sale in the USA, 3 million) we are likely never to get. This along with an F-18 will complete the Alberta Fighter collection and our East side displays. There is along way to go, just gotta figure out how to do it. As far as the runway...the expropriation article in the Journal awhile ago had the development ED quoted as saying late summer 2013, beyond that I don't know more than anyone else. And yes there are many if we cannot get them before the runway closes we will not be able to get them at all due to the cost of transport/disassembly-assembly. The larger aircraft simply cannot be assembled-disassembled safely without very specialized equipment or by volunteers without professionals involved. Could we please move this thread to Heritage and History? I'm resurrecting this thread as circumstances have been rapidly changing and as confirmed information comes available I would like to have an appropriate place to post it for consumption. This will clean up those threads and help keep them on topic as well as get Alberta Aviation Museum latest information in the right thread. Meetings are ongoing with the CoE representatives and EHC representative including today. I hope to have the Alberta Aviation Museum Association release confirmed information as it comes available. Last edited by Thomas Hinderks; 26-09-2013 at 09:15 AM. If I move the threads you asked and combine them with this, they will insert chronologically. That would be a mess. We can leave it as it the links should do. Or if you think it better I can take the time to cut and paste as quotes. Whichever direction you think best. It's been known about for a very very very long time. I walked through the wreck years ago...nothing left to salvage darn it. It's also not a fighter, it's a long range amphibious flying boat patrol bomber. What is cool is the Tofino airport not far from the wreck is a WW2 base nad many of the shelters, bomb dump buildings etc still exist and you used to be able to access them...very eerie. So with the acquisition of the Avro Lancaster from Edmundston, I'm very curious what the future is looking like now for the museum and it's sister museum (if I can call it that) in Villeneuve? And in reference to comments earlier in the thread, could Villeneuve house planes like the Hercules if it were to be acquired? Also since it has been two years since the last post, not including my previous post, has there been any progress on some of the other planes mentioned that the museum was trying to acquire? The AAM is undergoing a rather large transition right now. A new interpretive plan is underway, and now that the Lancaster can be confirmed and announced, plans are underway for how it will be housed in the existing hangar. The AAM has entered into a very positive and collaborative phase with the City of Edmonton, the EHC, and the Blatchford community to be a showpiece for the new development. Everyone involved wants the history and impact of CYXD to be commemorated, and this Lancaster is a great way to tie in the Northern mapping and exploration. 408 Squadron was there as well, and they are beyond excited to have a piece of their history coming here. They are rounding up volunteers to assist the museum with this project. Donors are now confirming their initial offers now that the vote at Edmundston City Council is complete. The folks out in Edmundston should be congratulated for all the work they've done, and the museum will make sure to commemmorate this work. Anyone can get involved or get more information on both the Lancaster and the new Interpretive Plan/Transition plan for the museum by e-mailing [email protected] You can donate via the web at https://www.albertaaviationmuseum.co...line-donations. 780-451-1175 is the phone number. Thanks. I was thinking of doing that myself or ask admins to move the posts to this thread, but you beat me to it Cod Father. I do hope that the city and maybe even the province can help to emphasise the importance of the museum but also the hanger and what the area (Blatchford) means to Canadian history. ...just for disclosure...I was elected as Vice President of the Board of Directors at the recent Alberta Aviation Museum AGM on March 15th...leaving my role as Treasurer. The current plan is to have the membership review the progress mid-May, and a general public consultation session in the late June timeframe. This of course is subject to how the design progresses. The Blatchford campus and the collection therein will be focused on 4 thematic areas: Blatchford Field and Aviation in Edmonton, 418 (City of Edmonton) Squadron at War and Peace, Northern Bush Flying, and the British Commonwealth Air Training Plan (BCATP) – the very reason we have the hangar in the first place. These are being further stratified with Kei Space, but the overall transition plan received unanimous support from City Council’s Community Services Council, and it received overwhelming support at the AAM Special General Meeting – with only 2 votes against out of 72 members attending, and 0 recorded abstentions. As for the aircraft acquisition list, the AAM is reviewing all aspects of the collection, including this list, in light of the Blatchford development, the Villeneuve Campus, and the results of the Kei Space consultation. So far, there are plans for a true archives and library with the requisite HVAC and safety controls, open lighting, bi-lingual signage, and more. This will be further stratified in the weeks ahead. The relationship with the City of Edmonton, the Edmonton Heritage Council, and the Blatchford Development is in a new phase. All are aligned to the direction the AAM is taking going forward. The City of Edmonton is doing a lot to not only renovate the building, but taking over aspects of the maintenance of the facility. The details are being worked out, but the HVAC system will be replaced, the ceiling is going to be inspected and painted according to Heritage guidelines, new electrical, fire suppression, security, and others are included...and the façade is up for the façade renewal grant in conjunction with the newly reformed Kingsway District Association. All involved are keenly aware of the building's importance to the development, to the city as a whole, it is a registered historic building, and our new lease/operating agreement will reflect this. So to your point of the City stepping up, they are. There is more to come, but I cannot disclose that at this time. What I can say is that they are very aware of the importance of the museum and the organizations they house. The City and the Blatchford development are integral partners in the AAM's success. Representatives from the City and Council, along with the EHC and Blatchford, attended and participated in the first Kei Space workshop back in February. The ideas that all brought to the table were amazing. All reps actively participated in the discussion, and I will admit it was a lot of fun! In short...rumors of the closure of the AAM are not true. No one is forcing the AAM out, the City of Edmonton has no designs to take over the actual museum operations, and the Blatchford development wants us there! The AAM is staying put! The Villeneuve Campus is taking a slower and more deliberate approach. Instead of rushing headlong, the museum is now looking at some existing space. The owners and operators out at Villeneuve want it integrated within the existing development vs far removed. I was at the last Villeneuve Owners meeting, and was told point blank that they flat out want us in another location on the field and within the existing development. This also aligns to the reality that Alberta Transportation will not be allowing 3 exits into Villeneuve within such a short span - indeed the second entrance is only on a 5 year renewable lease...and that one is tenuous at best. They'd rather have us within the Villeneuve ASP as well. All are very excited about the Museum's second flying campus. The AAM is working with the owners, EIA, and Sturgeon, St Albert, and the Joint Villeneuve Task Force to make this transition to another location on the field. The AAM has 2 potential locations, and a 3rd recently was offered by an onsite owner. More details will follow as they become available. So, in summary, there are a lot of exciting things happening with the Blatchford Campus of the AAM. The public will be invited, and frequent updates will be made to the Facebook page, the new Twitter account @AltaAvMuseum, and we will soon be revamping the website as support for the current version ran out some time ago – rendering the site completely unstable as we found out during the Lancaster announcement. A simple page update brought the site down for 6+ hours. You can also e-mail [email protected]. There is also a pending announcement out at Villeneuve. Thanks for the very detailed update. I will be very much looking forward to new information as it becomes available. Oh on a sidenote, but I believe very very important. The Air Force Museum of Alberta has a virtual tour on their website. The tour is fine but one major problem is that they have the RCAF march playing in the background and I couldn't find a way to turn it off. I love the song but I got startled when I first went on because my volume was up and out of the blue the song started playing. Music and sounds are great but just make sure it is a solid website and you won't need all the bells and whistles. I'm so excited about the Lancaster Bomber. Out of the few surviving planes, there will be three in Alberta, with the others located in Nanton and Calgary. I just hope that it will be hangared and not left to bear the brunt of various weather systems. If we knew then what we know now, there would be a lot more warbirds in existence, but unfortunately most were dismantled and sold for scrap. The remaining aircraft are virtually priceless. Last edited by 24karat; 21-03-2015 at 09:49 AM. I'm curious to know with which squadrons the two Lancasters were associated. Reason being my dad served with 97 Squadron based at, I believe, Bourn in Cambridgeshire, England. That airfield also still exists and is now home to a flying club. From the website "The World's Surviving Lancasters"
Flown to England May 1945, Stored at No. 32 Maintenance Unit awaiting assignment to a squadron. Returned to Canada August 1945. Modified to Mk. X Maritime Reconassiance, 407 Sqaudron (RX-136). Part of the second production batch of 130 aircraft ordered from Victory Aircraft Limited, Malton, Ontario, Canada. Serial numbers in this batch included FM100-FM229. Aircraft were equipped with Packard built Rolls-Royce Merlin 28, 38 or 224 engines. On Public display at the Calgary Aero Space Museum, Calgary, Alberta, Canada. Modified to Mk. X Maritime Reconnaissance, 407 Squadron (RX-159), 103 Rescue Unit. Part of the second production batch of 130 aircraft ordered from Victory Aircraft Limited, Malton, Ontario, Canada. Serial numbers of this batch included FM100-FM229. Aircraft were equipped with Packard built Rolls-Royce Merline 28, 38 or 224 engines. On public display at the Bomber Command Museum of Canada, Nanton, Alberta. Flown to England May 1945, No. 32 Maintenance Unit, 434 Squadron, 428 Squadron (NA-R), Returned to Canada 2 June 1945. Modified to Mk. X Aerial Reconniassance, 408 Squadron (AK-882). Part of the first production batch of 300 aircract ordered from Victory Aircraft Limited, Malton, Ontario, Canada. Serial numbers of this batch include KB700-KB999. The first 75 aircraft of this batch were equipped with Packard built Rolls-Royce Merlin 38 engines. Whilst to remaining 225 aircraft were equipped with Packard built Rolls-Royce Merlin 224 engines. Deliveries commenced to England in September 1943 and were completed in May 1945. Average rate of production was approximately 4 aircraft per week. Last edited by 24karat; 21-03-2015 at 09:54 AM. We are working closely with the other Lancaster owners in the country, and Nanton is on board with sending us a copy of all their documentation - including what they have on KB882 specifically. Our detailed RFP included a guarantee that this aircraft will be stored indoors. The team had several additions to the requirements, including daily webshots or even a live feed of the spot where KB882 will be restored, and eventually where it resides in the Hangar. We will do recordings of any activities around KB882 and make sure the folks in Edmundston get a copy. ...please forgive the plug, but all of your support is very welcomed and very valuable. Edmundston tried hard, but couldn't get the capital to save her...so that is why they had to regretfully let it go. Part of the RFP included a monument/display back to Edmundston for their airport or city hall... We do have several larger donations coming from the private sector, but every little bit helps. Labour, cash, expertise...it is all welcomed. We do have the basics in place or we would have never bid...but the overall restoration can be accelerated when we are able to get professionals on board. For example, we plan on getting all 4 Merlins running...like Nanton...and that is not cheap or easy. We'd rather pay a professional to do this part! So, if you can, http://www.albertaaviationmuseum.com...line-donations , or e-mail [email protected] to offer your suggestions or labour. Oh on a sidenote, but I believe very very important. The Air Force Museum of Alberta has a virtual tour on their website. (...) I love the song but I got startled when I first went on because my volume was up and out of the blue the song started playing. Music and sounds are great but just make sure it is a solid website and you won't need all the bells and whistles. ...and thank you for the website coaching. The webmaster/author of this site presented a few options a couple years back, and they are simple and easy to use. Uncluttered....mobile friendly...HTML5 based...device/OS agnostic....and yes, no cheesy unstoppable sound effects. I may be no real expert but I am always willing to lend a hand if I can. Additionally I'm wondering if you guys will be needing some help in restoration on a more general basis. I haven't worked on planes and am not really an engine guy (although I'm not completely without skills as I am a carpenter and have been trying to learn a bit about engines, but I would be very willing to lend any hand I could to help with the restoration of the Lanc. You can leave your contact info at the museum's front desk, or at 780-451-1175 during business hours. You can also e-mail [email protected]. The volunteer coordinator can link you up with the project team. Sounds good and meanwhile it's great to see all the updates. I have not seen any updates about KB882, the Lancaster Bomber that is to be moved from New Brunswick to Edmonton. I hope the move will still happen, and I hope no news is good news. Can anyone offer new info? They flew the 737 out to Villeneuve and it has all but been forgotten. Disgraceful to see it sitting in the weeds nowhere close to the terminal. Was by CZVL the other day, looked like they were about to move the 737 to make it accessible. Anyone every need a good movie prop or training that involves an airliner? Best contact the Alberta Aviation Museum for use. Anyone on here ever do Corporate Challenge? I wonder if Corporate Challenge would so a special event aircraft pull with the 737? Lots of talk on Blatchford build out over the years, so I thought I would start a thread on how the aviation museum property will interface and link into and blend with the Blatchford neighbourhood instead of becoming a barrier. There had been some talk on how to save the museum building itself. Since it is a provincial historic resource over 80 years old, there are certain things that cannot be done due to the heritage nature of the building. One idea was to build a proper decorative shell around the building as has been done with so many historic structures in Europe. With such a massive area space for roof, solar power has been talked about. I would be interested in hearing your thoughts on this piece of real estate. Lots of talk on Blatchford build out over the years, so I thought I would start a thread on how the aviation museum property will interface and link into and blend with the Blatchford neighborhood instead of becoming a barrier. Quite an interesting idea considering the wood construction is venerable to elements more so that brick and concrete. The other hangar on the east side of the airport...Is it being demoed? I think the PWA hangar idea can be forgotten about. As for the rounded roof hangar on the east side, its think its days are numbered. Confirmed! The 737 has been moved into position off of the taxiway so that it could be easily pulled up on to the hard surface. She's down at the south end of the field. Had a thought, remember those nice stone walls of the old RAM in Glenora? I wonder if they could be use to form a nice box with steel and glass around old hangar 14 to protect that provincial historic site? The Alberta Aviation Museum is holding a Fall Fundraiser to generate additional revenue in support of our 2019 programming initiatives, with a goal of raising $10,000. Tickets are only $5 each, and as a member, you have the benefit of being able to sign them out to sell to your friends and family. Any Eskimos fan will love the chance to win the limited edition Epic Legacy of the Edmonton Eskimos book, and the draw coincides with the kickoff to the Grey Cup Festival here in Edmonton! Please contact Zena at 780-451-1175 ext 106, or [email protected] to arrange tickets for pick-up. Individual tickets are available for purchase at the front desk. PS. We have started processing membership renewals for 2019. Don't miss out, renew early! Right before Christmas I got an e-mail from the Alberta Aviation Museum. They have finally inked a 25-year lease with the City of Edmonton and the Budget, surprise surprise, had operational dollars for this year only. Checking in with some folks tonight, found out the Alberta Aviation Museum Association is looking for new members with experience in accounting, law, strategic planning, engineering, fundraising, and business board experience to join their board of directors. Directors should be a museum member by Feb 15, 2019.